Off Rental Used – Air Cylinder Included. Lightly used gear – no damage, rips or tears. Functions 100%. Little to no signs of use/wear. *Free shipping and money back guarantee! Creating buoyancy and helping you float to the surface, the 150-liter airbag not only decreases your burial depth but also protects your head and neck from trauma in an avalanche. Integrated low profile avalanche airbag pack to carry avalanche safety equipment, gear and a few other essentials. Full front, side and back protection with 1 mm of hard shell sandwiched between two layers of PE foam. Features integration for BC Link Radios, hydration sleeve, left or right side trigger mount, fixed leg strap, internal and external shovel attachment, dedicated shovel/probe sleeves, dry main compartment, multiple internal pockets, storm zipper flaps, heavy duty ballistic nylon base, compression formed back panel with internal support stay, height adjustable waist belt for torso length, dual hip belt pockets, and fleece lined goggle pocket. If you are a backcountry snowmobiler, this avalanche airbag pack is for you. Preventing or minimizing burial depth is the key to reducing avalanche fatalities. That’s because the majority of time in an avalanche rescue is spent on excavating the victim. An airbag is designed to keep you at or near the surface, minimizing excavation time. How do Float airbags reduce burial depth? Inverse segregation, more commonly referred to as the ‘Brazil nut effect’ is the science behind why airbags work. The turbulent movement sorts different shaped objects by size (similar to the way large Brazil nuts will rise to the top when a bowl of mixed nuts is shaken). Smaller objects are more likely to fall into the voids created by the turbulence, while larger objects move to the top. 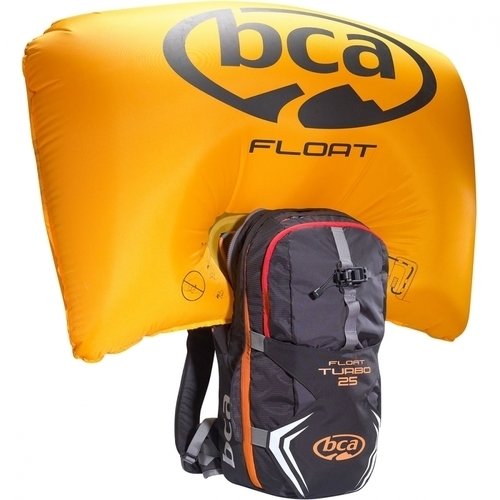 In addition to increasing your overall buoyancy, the Float avalanche airbags are designed to make a backcountry user ‘bigger’ than the surrounding pieces of debris in an avalanche. The Floats use compressed air in the cylinder to fill the bag and make the user’s volume larger, reducing or eliminating burial depth and increasing your chances of survival.